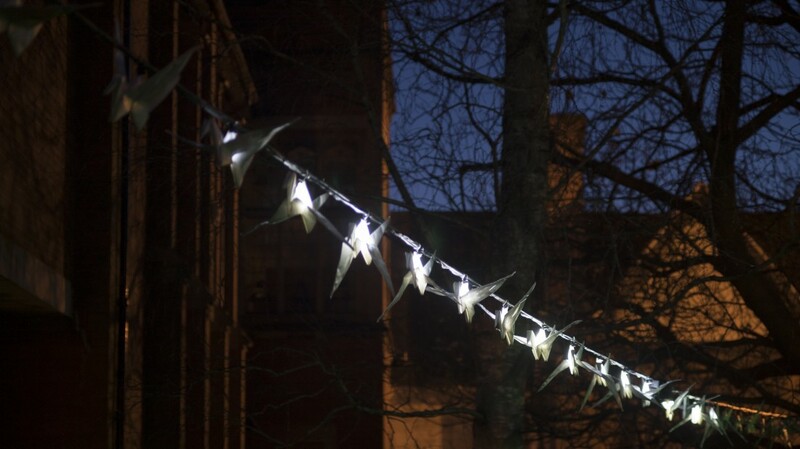 Chirp&Drift is a flock of small illuminated instruments temporarily making a home by nesting in a majestic beech tree in the Storey Gardens. The flock chatter in morse code messages, some of which will be de-coded, and others that will dissolve into nighttime whispers. Chirp&Drift artworks extend into the Gallery including bird imitations and interactive pieces. Chirp&Drift aims to highlight processes where errors and miscommunications occur, as a metaphor for broken ecologies such as interruptions to habitats, narrowing sonic bandwidths for bird-calls to be heard clearly, elongated migration routes and the implications all these factors have on bird-life. Support in kind from Knowle West Media Centre ‘The Factory’ and RSPB Leighton Moss.